Zantrex-3 is fat burner that rates itself very highly indeed. Super charge your weight loss results and 546% more weight loss than the leading Ephedrine based diet pill – are two of the gimmicky soundbites used on the official website. The Official Zantrex-3 website gives equal billing to the energizer effect that compliments the weight loss compound contained within the formula. According to the marketing Zantrex 3 is the best selling diet pill in America. A fat burning diet supplement that also produces extra energy for the user. Another multipurpose diet pill that promises the aerth but sadly does live up to expectation – an increasing trend nowadays as far a diet pill are concerned. The inclusion of a stimulant can be responsible for a nausea, sickness and diarrhea as well as the restless or jittery feeling described above. Consumer reviews and reports are not generous or overflowing with praise. Not a weight loss pill or diet supplement to trust or pin your weight loss hopes upon. If you really want to experiment then the official Zantrex 3 website is an obvious stockist – we wont provide a link but it should not be that difficult to guess. There have been several premier diet pills made available to consumers that are both clinically proven and been subjected to scientific trials. 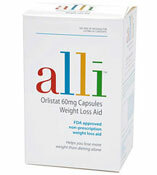 Alli is quite possibly the most discussed over the counter diet pill of the year.